When I bought my Sega Saturn, I came up with a list of games and accessories I absolutely HAD to get with it. 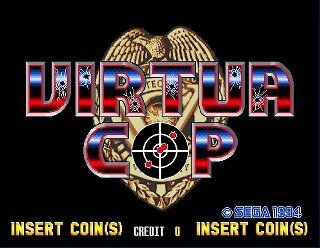 The Virtua Cop games and the Virtua Gun made the list, pretty damn easily, in fact. 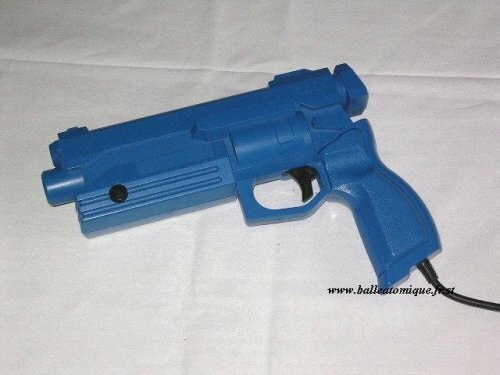 And with damn good reason… To this day, I don’t think any light gun has matched the Saturn’s Virtua Gun for being the right feel, so accurate and downright reliable! Sega decided that the conversion of their arcade hit should retain the feel, and as such the Virtua Gun was essentially identical to the ones found chained to arcade cabinets around the country. 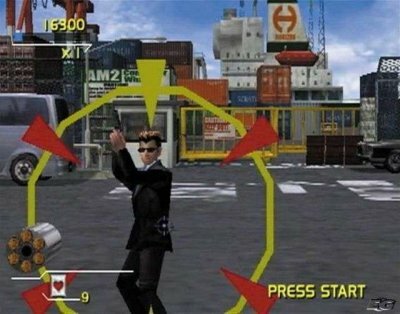 A swift crack at the Gun Calibration screen in the options menu ensured the gun worked from wherever you sat / stood / crouched, and that was it, you were off into the Virtua underworld to shoot first, ask questions later. Well, let’s be honest, it’s a case of shoot or be shot. Actually, no, it wouldn’t. It’s so much damn fun I wouldn’t care if there weren’t any extra weapons, but nevertheless there is, for a limited period you can have the 15-shot clip of the Automatic, the power of a 3-shot burst Rifle, the Magnum that shoots through barrels and walls, the shotgun with a nice spread or the full automatic of the Machine Gun. All you have to do is find the weapons (dead baddie, shoot a crate) and shoot it, and mysteriously it’s yours. No, I’ve never really liked that system, but in the case of on-the-rails shooters, what else can you do? 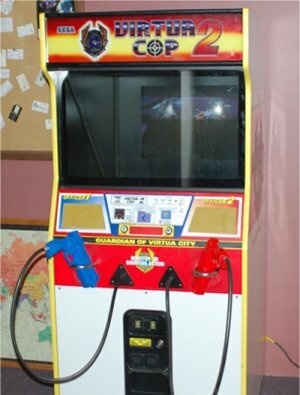 One thing Virtua Cop offered that Virtua Cop 2 is sadly missing is the extra “Training” mode. 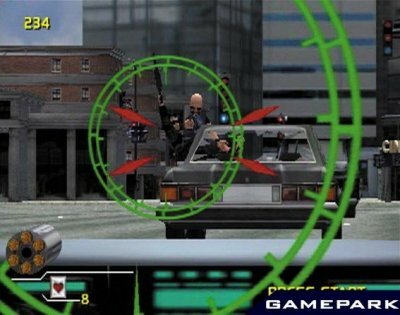 This was a stroke of genius on the part of Sega, this mode essentially thrusts you into a shooting range on which you can hone your shooting skills. Either compete against some of the game’s characters in a shooting contest, or take on the series of goals to progress through the various ranges and target formations. Performing well in this event is rewarded by a rating in the form of Virtua Cop Badges. So, with very little to actually complain about with these games, and with Sega getting almost EVERYTHING right, then this is a moment not to miss out on, right? Hold on just a second. Unlike some other consoles and computer hardware of the past, which aren’t going to have any problems, the light gun, or at least most of its incarnations, are going to become useless. As people upgrade from their Cathode Ray Tube TVs to the LCD and Plasma panels, retro collectors will notice their light guns will no longer work. Indeed, the instructions for light guns claim that they will ONLY work with bevelled (curved) 50Hz TVs, and not 100Hz TVs, pure flat tubes, projection TVs or any kind of modern flat panel. So although these games come with the official Fishsta seal of recommendation, they do also come with a warning… make sure you’ve got the right equipment before investing in them. Otherwise, you’ll end up very disappointed.